Venezuelan President Hugo Chavez has threatened to jail any US officials caught gathering sensitive information about the Venezuelan military. His warning came hours after Caracas accused US embassy staff of spying. A spokesman for the US embassy said officials had received no communication from the Venezuelan authorities about the matter. 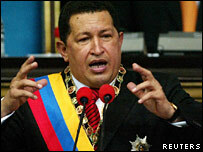 Mr Chavez has repeatedly accused the US of supporting attempts to overthrow him, an allegation Washington denies. "The next time we detect an officer or a civilian official, above all US military officers, trying to get information from our armed forces, we're going to lock them up," Mr Chavez said at the World Social Forum in Caracas. On Thursday, Venezuelan Vice-President Jose Vicente Rangel said some of the country's "low-ranking officers" had passed information to the Pentagon. Some of the individuals concerned had been detained and some had left the country, Mr Rangel said. The vice-president did not disclose the number of people involved in the alleged spying, or the kind of information they were said to have passed on. Press reports said that those detained were naval officers. The US embassy spokesman said it was an "internal matter" for Venezuela.